One of the craziest financial creations on earth, available only near the peak of enormous credit bubbles when nothing can ever go wrong, became available this spring: 100-year bonds issued by governments or companies in emerging countries, in currencies they don’t control. Yield hungry investors in developed markets who purposefully had been driven to near-insanity and drunken benightedness by the zero-interest-rate policies of central banks around the globe jumped on them. For them, it was the way to nirvana. At the peak of Draghi’s QE hype in April, Mexico, which has a long history of debt crises, was able to sell €1.5 billion of 100-year bonds denominated in euros because yields were even lower in the Eurozone and bond fund managers there even more desperate and insane; at a ludicrously low yield to maturity of 4.2%. Even more inexplicable was just how Petrobras, Brazil state-controlled oil company, was able to bamboozle investors on June 2 into buying its 100-year dollar-denominated bonds. At the time, the company had just ended a five-month delay in releasing its financial statements. It’s tangled up in a horrendous corruption scandal that has reached the highest echelons of political power. It’s backed by the Brazilian government whose credit rating, as everyone had been expecting for months, was cut to junk last week by Standard and Poor’s. To top it off, Brazil has been facing a deep recession and a plunging currency, which makes paying off dollar-denominated debt prohibitively expensive. And it renders that debt toxic. Petrobras, whose credit rating was cut to junk the day after Brazil’s – though Moody’s had cut it to junk seven months ago – faces other, even bigger problems: over $130 billion in debt, the most of any oil company, and the terrific collapse in oil prices. OK, in the second quarter, oil rallied sharply, and some bond-fund folks might have thought that the oil bust was over though the entire world was still practically swimming in oil. And amidst this buoyant mood about Petrobras’ prospects, the company was able to sell $2.5 billion of 100-year dollar-denominated 6.85% bonds to fund managers in the US and elsewhere who were blinded by their own optimism and driven to insanity by years of zero-interest-rate policies. Now, three months later, these “century bonds” have gone to heck. The three largest holders of these bonds are Pacific Investment Management, Fidelity, and Capital Group, according to Bloomberg. After Petrobras’ credit rating was cut last week, the bonds traded at 69.5 cents on the dollar. That’s a big loss for these geniuses, or rather for their clients, in just three months. To be able to sell these misbegotten century bonds, Petrobras had announced in June that it would try to unload $15 billion in assets by the end of 2016. But that plan isn’t working out very well in this environment where prices for these assets have plunged. So now it’s scuttling that plan and instead is focusing on cutting $12 billion in expenses by 2019…. This is the sort of peak insanity that can only occur near the peak of multi-year, central-bank-instigated credit bubbles. But this is just one example in a global nightmare now playing out. In total, $9.6 trillion of this sort of US-dollar-denominated debt issued by non-bank borrowers outside the US were outstanding by the end of the first quarter, according to the Quarterly Review released Sunday by the Bank for International Settlements – after more than quadrupling over the past 20 years. 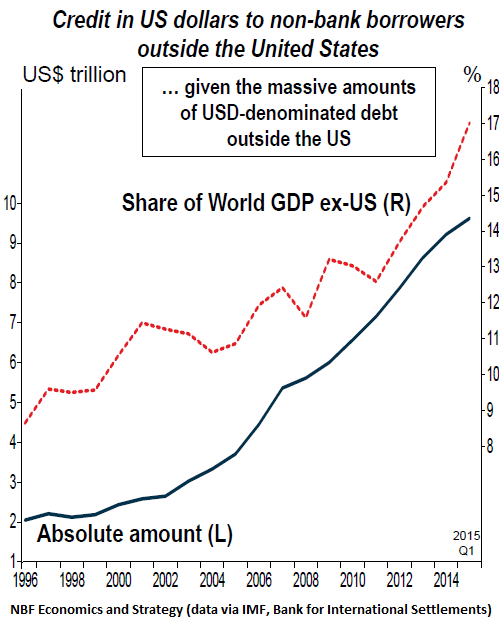 In relative terms, this dollar-denominated debt reached a record 17% of global GDP (excluding the US), a ratio that has doubled over the past 20 years! If growth of this dollar-denominated debt continued at the same rate in the second quarter, including the 100-year bond folly, this number has likely reached $10 trillion by now. 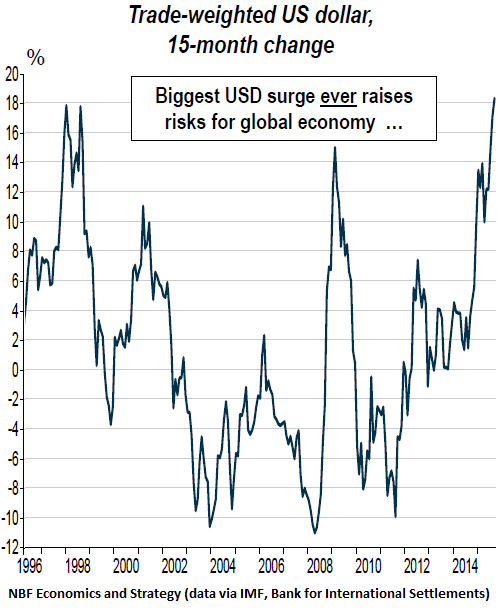 Thanks to diverging monetary policies between the Fed and other major central banks, the trade-weighted USD has now gained more than 18% since June of last year, the fastest 15-month appreciation ever. That cannot be good for USD borrowers outside America. A strong dollar relative to emerging-market currencies makes it very expensive or impossible for the issuers in the emerging markets to service their dollar debt. And thus, as Rangasamy concludes, the world today is “more exposed than ever” to the strengthening dollar, just when the mountain of dollar-denominated debt turns out to be larded with explosives. This is one of the many outcrops of the ingenious monetary policies exercised by our central banks. It’s piled on top of the enormous asset-price inflation that has occurred over the past six years. It’s a risk too ugly to behold, as bond investors in the US are beginning to find out.